Prime Minister David Cameron has given the green light to plans for a high-speed "HS3" rail link in the north of England, following a report by HS2 boss Sir David Higgins. Sir David said better rail links in northern England were "desirable" and "possible" after being asked to look at ways of maximising the benefits of HS2. The government said it would now develop a strategy looking at options, costs and a delivery timetable for HS3. A report will be produced in March. Mr Cameron welcomed the report and said improving connectivity and reducing journey times was "crucial" to the government's long-term economic plan for the north of England. "These sort of decisions - decisions about our country and the future of rail - matter. They are not always popular. HS2 is not always popular. But I profoundly believe they are right," he said. He said that it was a "big flaw" of the original HS2 plans to miss east-west connections. Journey times from Manchester to Leeds could be cut from 48 to 26 minutes. The east-west improvements backed by Sir David would be in addition to the north-of-Birmingham phase two of HS2, which will see a Y-shaped route going from Birmingham to Manchester and Leeds. Sir David did not make specific proposals on how to achieve faster times, but said a mixture of current and new projects would make them possible. He said improvements to rail services between Leeds and Manchester could involve a doubling of trains per hour, with either a new high-speed track and tunnel under the Pennines, or an upgrade to the existing line. He told BBC Breakfast: "If you look at the two huge cities - Leeds and Manchester - less than half a percent of the people in each city travel to the other city to work. Dr Richard Wellings, from free-market think tank the Institute of Economic Affairs, described HS3 as "little more than a costly vanity project". "Rather than creating headline-grabbing policies, government resources would be better spent on smaller-scale schemes that deliver high returns for the taxpayer," he said. Stop HS2 campaign manager Joe Rukin said HS3 would be even more expensive per mile than HS2. 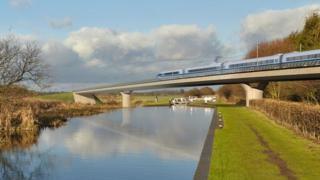 But Sir David said he could not see how HS3 could cost more than HS2. "It will be a combination of upgrading existing lines, also some new tunnel," he said. "There's no reason why it would be more expensive." The announcement is a long way shy of any solid commitment to speed up trains across the Pennines. The government has just asked for some possible routes and prices…. a cynic might say it's all good publicity in the run-up to an election. And one industry expert told me HS3 could cost £7bn. But that's not to say that it won't happen. There is real momentum now behind the campaign to help England's great northern cities compete with London. If you've ever caught a train between, say, Hull and Liverpool, you'll know how frustratingly slow and often overcrowded it can be. It doesn't exactly oil the wheels of industry being stuck on an overcrowded old chug-chug for hours on end. Londoners are about to enjoy their brand new £16bn Crossrail train line, due to start running in 2018. Many feel the North is long overdue for the same kind of help. George Osborne said in June that a high-speed rail link between Manchester and Leeds could help to create a "northern global powerhouse" and asked Sir David to consider how to improve east-west connectivity. In his report, Rebalancing Britain, Sir David said: "I firmly believe that substantially improved services east-west across the North are not only desirable, but possible. We need to turn the aspiration into a practical plan." He said the plans were "as important to the north of England as Crossrail is for London". The chancellor has set up a new body called Transport for the North, made up of the main northern city regions, which will work with the UK government to produce a strategy for the region. In the report, Sir David recommends sticking with the plan to split the HS2 line in two after the London to Birmingham stage is completed. An eastern leg will stretch from Birmingham to Leeds, via the East Midlands and South Yorkshire. A western leg will run from Birmingham to Manchester, via Crewe. Sir David also recommends a north-west England hub for HS2 is built in Crewe, saying it is the "best way to serve not just the local region, but also provide services into the rest of the North West, north Wales and Merseyside". Speaking at the launch of the report, Chancellor George Osborne said the government "need to take David's report and turn it into a proper plan that can now be legislated in parliament". It's likely that the faster trains in the north of England wouldn't run on completely new lines, but a mix of upgraded and new tracks. And while the proposed HS2 route would have a maximum speed of 225mph, the suggested speed for the new trans-Pennine link would be around 125mph. That's the same as trains currently running on the West and East Coast Main Lines. Rail services across the North are considerably slower than those in the South. A journey between Leeds and Manchester currently takes on average 55 minutes for a distance of 42 miles. In comparison passengers can get from London to Reading in 25 minutes, a distance of 36 miles. Mary Creagh, Labour's shadow transport secretary, said: "Labour supports high-speed rail to tackle commuter overcrowding and to improve connections between cities in the North and Midlands and London. "We have repeatedly said we need value for money for the taxpayer and to improve the existing plans to maximise the benefits for the whole country." Liverpool Mayor Joe Anderson said it was "disappointing and illogical" that Liverpool was not included in the HS3 proposals. "We are once again being by-passed by an investment that will fail to realise its supposed purpose," he said. Construction on the £50bn HS2 project is due to start in 2017. Phase one involves a new high-speed line from Euston in London to Birmingham, with an expected completion date of 2026. Phase two was originally scheduled to be completed in 2032/33, although Sir David is keen for this date to be brought forward. Objectors to HS2 have said the scheme will cause an unacceptable level of environmental damage, loss of homes and disruption to many communities. But in January the Supreme Court rejected a legal bid to force further scrutiny of the first stage of the government's plans.